July has been an eventful month so far. We’ve had multiple doctor’s appointments for our son who will be having his tonsils and adenoids removed on Friday. Getting ready for a surgery like this isn’t easy. Between the additional challenges that autism presents and his fear of doctors in general, it’s going to be a difficult week leading up to it. However, once we get through the surgery and recovery, we know he’ll feel much better. It’s because of all this craziness that we welcomed a wonderful distraction this last Saturday. Our families went camping at a beautiful spot in Kerrville, Texas. My husband and our little girl spent the night Friday, and then our son and I drove in for the day along with my mom and brother. It was hot with a heat advisory and temperatures reaching just shy of 100. We found ways to stay cool, though, between swimming, lots of cold drinks, and visiting in the shade of some of the beautiful, tall trees in the area. Having the chance to visit with family and just let the kids play with their cousins was wonderful. I think what I needed most, though, was the reminder that it’s the little things that really count. 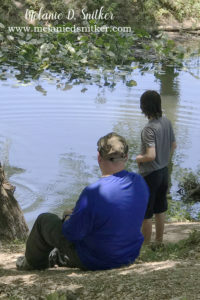 ~ Witnessing the simple joy my husband and son found in throwing rocks into the river together. ~ Cooking meals over an open fire. It’s amazing how much better it always tastes. ~ Taking our daughter to catch minnows with her net so she could watch them swim in a cage she brought. It reminded me of how I was at that age: Always trying to catch something in the water. She later gave the cage a hug before setting the fish free again. ~ Watching the cousins play together. ~ Laughing when our daughter put a bobber (no hook) into the water, and a turtle swam up and played with it for several minutes before swimming away again. ~ Enjoying the chance to make memories with family. 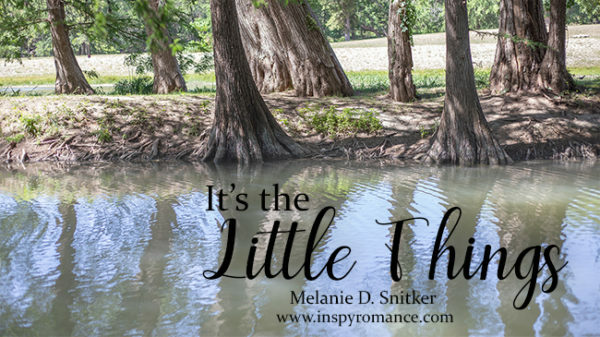 As we go through the surgery and recovery with our son, I’m going to remember that day at the river and how there are always little things to be thankful for. There are times we have to look harder than others, but if we make the effort, we’ll find them. If there’s something that’s made you smile lately, or that’s reminded you of the simple joys in life, I’d love to hear about it! For those of you who have enjoyed the Brides of Clearwater series, you’ll be happy to know that I’m finishing up Chrissy and Wyatt’s story. I plan to release Marrying Chrissy in the second half of August, and I can’t wait for you all to read it! Thank you for the prayers, we appreciate it! I know everything will be okay, but it may be rough for a few days. That’s wonderful that your husband and sons had so much fun cross country skiing on Sunday! I enjoyed listening to all the thins that make you smile. Thanks so much for sharing! Glad you had the opportunity to make some memories and enjoy family time. Best wishes. That hymn is beautiful, thank you for the reminder. And thank you, too, for the prayers for our son’s surgery! Good morning, Melanie! I am keeping your son in my prayers on his surgery. Thank you for sharing, honestly, I am not the camper, but everything you wrote sounds lovely! Prayers for your boy’s surgery…and for more times of simple refreshing. My life is nuts like everyone else’s, but I find so much delight in the plants, trees, animals and noises of our ranch. The old front porch sitting that people used to practice was popular for a reason, I think. Also sitting with some needlework or shelling peas- keeping the hands busy while the mind wandered, was and is good for the soul. I’m all for bringing it back. Otherwise just being out in nature, generally speaking, is my happy place too. Thank you so much for the prayers. I agree, keeping the hands busy while the mind wanders is important. I’m all for bringing back everything you mentioned, too! Praying for your son. May he be filled with God’s peace. The simple thing that makes me smile is working in my garden and listening to the birds. Thank you, Lucy! Working in your garden while listening to the birds sounds lovely. My prayers are with you and your son. Just keep reminding him that he can have all the popsicles and ice cream he wants, when this is over. Thanks, Janet! Yes, we are stocked up with his favorite drinks, applesauce, pudding, and popsicles! That sounds great, Valerie! I hope you can catch some minnows and frogs this year. Enjoy every minute! I will be praying for you this Friday as your son goes through this. It’s hard to be a mom and not want to fix everything for our children. My heart goes out to you. As for the things which have made my heart smile lately, I would have to say spending a whole week with my two precious grand-daughters. (As well as our children.) We had a family event so everyone was around for it. Which is great since our children live in different cities from us. I appreciate it, thank you! You’re right, it’s hard when we just want to fix things for our kids and can’t. Oh, your family event sounds absolutely wonderful. Having time with family like that is huge! Melanie, I can relate to your son having surgery. Prayers for him and you as you go through this together on Friday. My grandson is 17 and has Asperger’s. He’s high functioning but stresses over things. Thursday he has a consultation to have his wisdom teeth removed. He is not looking forward to this and was hoping to have it done next summer. I will be going with my daughter and grandson for his consultation. My grandson and I are very close. We spend a lot of time together so he takes comfort in having me there too. We are hoping the wisdom teeth will be removed before school starts. This will be his senior year in high school and he’s an honor roll student. I’ll be thinking about your grandson, Nancy. I hope his consultation goes well on Thursday. If he does have to have his wisdom teeth removed, I hope it goes smoothly. It would be nice if we has to have them removed, that it can be done before school starts. I love that you and your grandson spend so much time together. It sounds like he’s a great kid and a great student. I feel for you Melanie. Our son had that surgery when he was 3. But it did make him feel better. He’s had seasonal allergies really bad and had to have weekly, then bi-weekly, then monthly allergy shots. We were able to stop the shots last year and he’s done great. Your trip sound idyllic. I love that part of TX. But you’re braver than me. I don’t camp – unless there’s a RV with air conditioning and plumbing involved. I’m glad your son felt better after the surgery. Sorry he had to go through that, though! I’m so glad you’ve been able to stop his allergy shots. I didn’t actually camp this time – way too hot. But our son and I enjoyed being there for the day! Such a beautiful post, Melanie. Love the reminders to appreciate the little things. 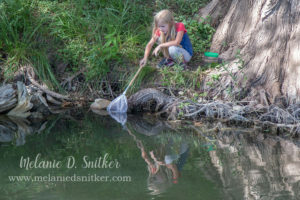 And the photo of your sweet girl catching minnows is precious!